LAS VEGAS: Clark County Sheriff Joe Lombardo who runs the Las Vegas Metropolitan Police Department (LVMPD) wants to be re-elected for a second term in June. 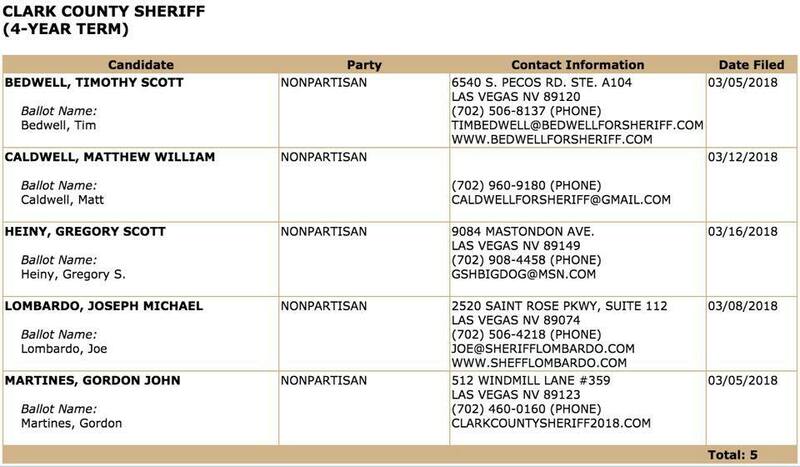 Four other candidates are challenging him for the position of the highest law enforcement officer in Clark County, Nevada. Lombardo’s comments throughout the criminal investigation of the worst mass shooting in modern American history combined with police misconduct by some police personnel put into question the integrity of the investigation. Lombardo was a one-man wrecking crew responsible for the worst public relations nightmare in the history of the LVMPD. His actions were not reflective of the professionalism of most of the men and women of the police department. To add further insult to the survivors and the families of those killed in the October 1 massacre, Lombardo has not released thousands of pages of documents and hundreds of hours of video relating to the investigation as ordered to do so by a Clark County District Court judge on Feb. 1. Lombardo’s response was he wanted close to half a million dollars from the press to release the evidence. On March 20, Steve Grammas the president of the Las Vegas Police Protective Association (LVPPA), the union that represents the 2,808 rank and file members of the LVMPD, sent out a letter to the LVPPA membership urging them to support Lombardo. 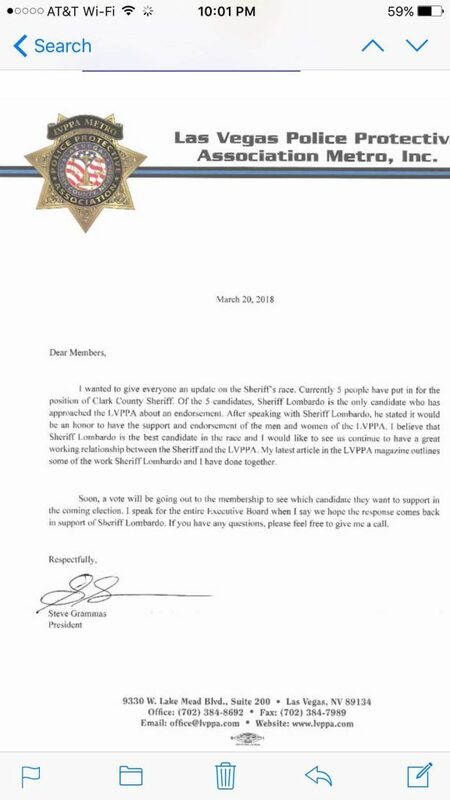 In part the letter stated, I believe that Sheriff Lombardo is the best candidate in the race and I would like to see us continue to have a working relationship between the Sheriff and the LVPPA. Soon, a vote will be going out to the membership to see which candidate they want to support in the coming election. I speak for the entire Executive Board when I say we hope the response comes back in support of Sheriff Lombardo. More than 80 percent of the LVPPA disagreed with Grammas. Last week we sent out the vote for who you all wanted to endorse for the coming Sheriff’s election. 2,808 emails to vote went out to our membership. We had 775 members cast their vote while 264 members opened the vote but did not cast a vote and 1,769 members did not open the voting email. The results are as follows: Joe Lombardo- 526 (68%), Timothy Bedwell- 183 (24%), Gordon Martines- 36 (5%), Matthew Caldwell- 21 (3%) and Gregory Heiny- 9 (1%). We did not reach the necessary 51% of the membership casting a vote in this endorsement. As such, and in accordance with the Bylaws, the LVPPA will not be endorsing any candidate in this election. Since all five candidates are non-partisan, whichever candidate receives more than 50 percent of the vote in the June primary, they win the election outright. Never forget the 58 people who died and the over 850 who were wounded and or injured on the Las Vegas Strip, October 1, 2017. It’s all about them. It should never have happened.